I recently had the pleasure of attending an invite-only press and blogger event at Neiman Marcus in Tampa for the launch of Givenchy Beauty. The line is exclusive to Neiman Marcus and only available at six Neiman locations nationwide. The Tampa Bay Neiman Marcus is the first location to carry the line. Kristy Noga, a make-up artist from Chicago, played up my features with Palette #3 Ecume on my eyes, Phenomen'Eyes' Mascara., and Le Rouge Perfecto. I got a chance to play with the Phenomen'Eyes' mascara and Rouge Perfecto in Perfect Pink, and decided to see how well it stacked up against my favorite Limelight products. The packaging of Givenchy cosmetics looks as haute as the fashion line with leather casing on some of the products. The main difference that I noticed right awaybetween the Phenomen'Eyes' mascara and Limelight’s Perfect Mascara is the wand; Givenchy’s Phenomen'Eyes' wand is meant to hold for application vertically, while Limelight’s Perfect Mascara is best applied horizontally. Both mascaras lengthened lashes but Limelight’s Perfect Mascara has lash-lengthening fibers in the formula for maximum volume and lengthening. I did try the Rouge Perfect in Perfect Pink and was less than impressed with the shade. This moisturizing balm naturally reacts with the pH of your lips to provide a shade that matches with your skin tone. I like the feel of the balm; it glides on and is very moisturizing but the shade was a bit too sheer for me. I much prefer Limelight by Alcone’s Enduring Lip Color in Sugar Plum. The color is a deep, matte shade of plum. However, I did find that Givenchy’s Le Rouge Perfecto pairs perfectly over the Enduring Lip Color to give it a creamier feel which eventually dries to a lovely plum stain. 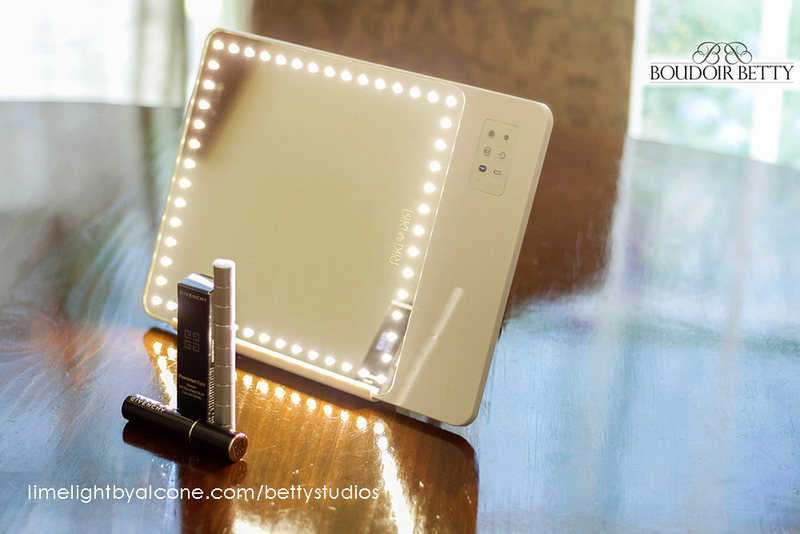 Make-up application is actually more fun with the Skinny Riki mirror from Glamcor. It features a magnetic holder for your phone (not shown) and bluetooth capability for the perfect selfie (no arms in the shot! ).